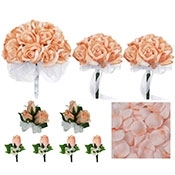 I can't thank you enough for the quality work you produced with my silk wedding flowers. 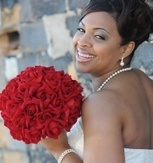 I placed an order with you in March and when I received my wedding bouquets I was flabbergasted. 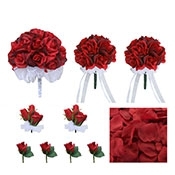 The silk bouquets looked just like the pictures on your website. Not to mention the price of the whole order was just under $100! 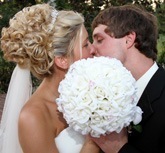 I have gotten nothing but compliments on the silk flowers when people look at my wedding album. 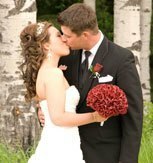 I have been giving out your website over and over to people getting married. 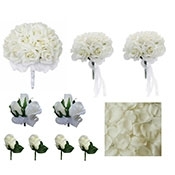 I must say I was a little hesitant on ordering silk wedding flowers and especially online. I ordered them and I was totally impressed at how beautiful they were. 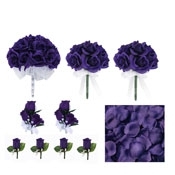 They really don't look like fake flowers at all! They were absolutely beautiful and the color was perfect! 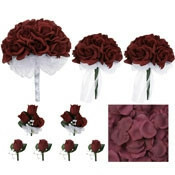 The silk bouquets were better than I ever thought they would be. Thanks so much! I will definitely tell friends about your website! 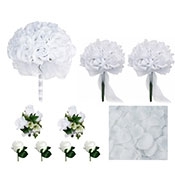 I ordered my silk wedding flowers from your company two weeks ago and I received them in great condition. I am very pleased with my silk wedding bouquets. I was nervous about buying them online not being able to see them! But I was amazed with them. I was also amazed with the cost. 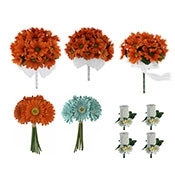 I was shocked at how low the prices were for all my wedding flowers. Keep up the great job! 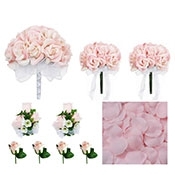 I ordered my silk bridal bouquet from you for my August Wedding. I just wanted to say that it was better than I ever imagined. Not only do my wedding flowers look terrific in photos, but even my guests could not tell they were artificial flowers. I had people come up and touch my silk bridal bouquet just to check. It was absolutely stunning! 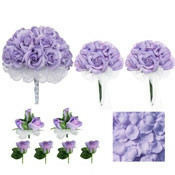 Thank you for a great wedding bouquet that will last a lifetime! We cannot thank you enough. Everyone raved about the wedding bouquets. They could not believe they were fake flowers. And the best part is we all got to keep them! 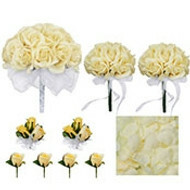 Our silk wedding flowers were GORGEOUS and we will be recommending you to everyone! Visit TheBridesBouquet.com profile on Pinterest. Every bride wants to carry a beautiful bouquet down the aisle on her wedding day. 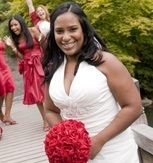 We have been providing beautiful bouquets since 1999, serving thousands of happy brides. TheBridesBouquet.com selects only the finest, highest quality silk flower bridal bouquets on the market today. Our years of experience in the bridal industry allow TheBridesBouquet.com to present you with exquisite and realistic silk wedding flowers in every bouquet and accessory. 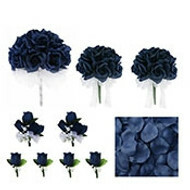 One of our most popular features, is that you can add bouquet jewels to any of our bouquets or corsages. We custom manufacture our jewels in several colors, so you wont find them anywhere else. Our wedding bouquets are all professionally and beautifully arranged by trained designers, so that your finished silk wedding flowers will look amazing. We also understand that brides don't want to wait for weeks to get their bridal bouquets so we ship your order as quickly as possible, with all orders shipping in 1-3 business days. 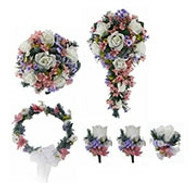 Let us provide you with the wedding flowers you need at a price you'll be thrilled with.